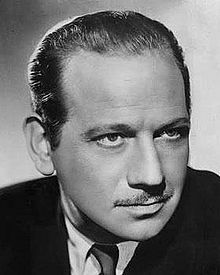 Melvyn Douglas, Actor, Multiple Award Winner, Lincoln, NE. Melvyn Edouard Hesselberg, better known as Melvyn Douglas, was born in Macon, Georgia on April 5, 1901.Â His father, Edouard Gregory Hesselberg, a German-Jewish immigrant from Riga, Latvia, was a concert pianist and composer.Â His mother, Lena Priscilla (nÃ©e Shackelford) was a native of Tennessee, and a Mayflower descendant whose father, George Shackelford, served as a general in the Civil War.Â The Hesselberg family eventually moved to Canada, settling in Toronto, Ontario, before moving back to the States and making their home in Lincoln, Nebraska. In the second year of America’s involvement in the First World War, 17-year-old Douglas dropped out of high school and volunteered for the U.S. Army. He was stationed at a fort in Cheyenne, Wyoming, working in the V.D. ward of the base hospital. Douglas was a great liberal and was an outspoken supporter of the anti-Nazi Popular Front in the Hollywood of the 1930s.Â Politically well-connected Douglas served as a director of the Arts Council in the Office of Civilian Defense before joining the Army during World War II. He was very active in politics and was one of the leading lights of the anti-Communist left in the late 1930s and early 1940s.Â Despite being a â€œmarked manâ€ during the McCarthy anti-red hysteria that wracked Hollywood during the 1940s and 50s, Douglas was one of the most popular actors in a career that spanned 50 years. Â In 1967, he became the fifth performer to win the triple crown of acting. Oscar: Best Supporting Actor, Hud (1963) and Best Supporting Actor, Being There (1979), Tony: Best Actor-Play, The Best Man (1960), and Emmy: Best Actor-Drama, CBS Playhouse: Do Not Go Gentle Into That Good Night (1967). On February 8, 1960, Douglas received two stars on the Hollywood Walk of Fame.Â One for his work in Motion Pictures at 6423 Hollywood Blvd., and one for his work in Television located at 6601 Hollywood Blvd.Â Douglas died in 1981 at age 80, from pneumonia and cardiac complications in New York City. Â Won Academy Award for Best Actor in a Supporting Role (1980). Being There. Won Academy Award for Best Actor in a Supporting Role (1964). Hud. Won Primetime Emmy for Outstanding Single Performance by an Actor in a Leading Role in a Drama (1968). CBS Playhouse.